A section of the Serpentine Creek has been converted to form the Natural Heritage & Water Park. The development of the Park is a result of the closure of Boobera Lagoon, to power boats, on indigenous cultural grounds. The Lagoon had been a favourite spot for waterskiing for the local area and was the only suitable waterbody for the purpose. 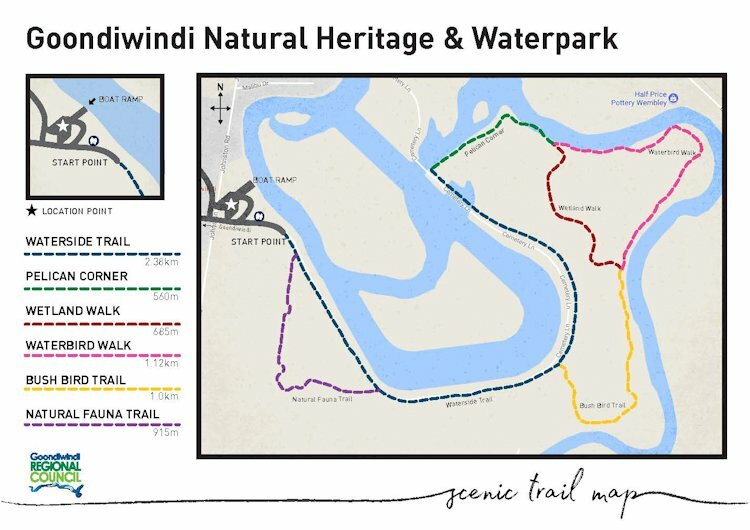 As a result of initiatives by the former Goondiwindi Town Council, the Federal Government through Environment Australia, made a decision to fund a Natural Heritage & Water Park, to make available skiing and boating facilities and to provide a focal point for tourism and recreation in the town and district. The 210ha recreational water park opened early in 2004 and offers plenty of activities for all ages. The purpose built 3km water channel provides great opportunities for water sports of all kinds including waterskiing, wakeboarding, canoeing and boating. It is also the perfect place to view the vast bird life, have a picnic on the lawn or swim at the "designated" area. The Goondiwindi Natural Heritage & Water Park is situated to the east of Goondiwindi Town. To get there take the Kildonan Road exit off the Cunningham/Newell Highway roundabout and turn the first left into Johnson Road. The entrance is through the gates further up the road on the right.